From the classroom to the spotlight, teachers Amanda and Jay Fischer know a thing or two about making the most of a summer. Both avid fans of the theater arts, the husband and wife team spends their break heavily involved with the Shadblow Theatre in Jenison. 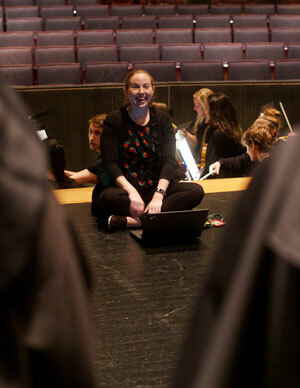 Amanda, the creative writing instructor and musical director at Grandville High School, first found her love for the performing arts through song. During the beginning of her Grandville career, Amanda served on the fine arts committee for the middle school though she was teaching English and history. “I had the students that were involved in theater but I wasn’t teaching them that skill,” she said. When she moved to the high school, the stars aligned and it turned out that a musical director was needed. “I went to the principal’s office and told him I wanted the job and told him about my experience, and the rest was history,” Amanda said. Eleven high school shows later, Amanda still is amazed by the talent she sees from her students. Jay, Learning Support Center supervisor at Grandville High School, had a much more reluctant start to his acting career. After that musical, Jay started looking for more shows to go see and decided that the theater was for him. 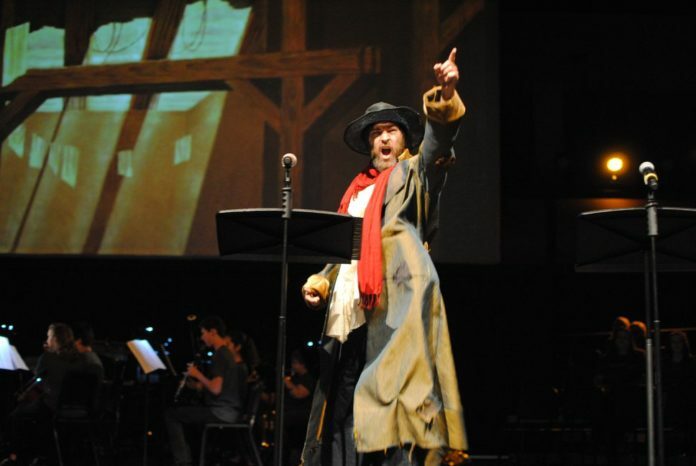 Performing in several high school plays and musicals, he took a brief hiatus in college. When Amanda and Jay met and married, one of the things they had in common was their interest in the performing arts. When Amanda was directing musicals for the high school, she would have Jay come in and help with odd things here or there. Working with Amanda at the high school was one of the main reasons Jay got back on stage. This summer, Amanda and Jay were involved in all four productions at Shadblow either on stage or behind the scenes. Often, summer productions mean working with students in a different way than in the classroom. Students are pretty excited to work with their teachers because it’s a different way of interacting, the teachers said. “At school you’re in an authority position, but when I’m in the show, me and the kids, we’re on the same level,” Jay said. “They think about us as these experts of the performing arts, but some of these kids are way better than I’ll ever be. Each play provides a different learning experience that can be brought back to the classroom, Jay said. “I have read so many books on acting and taken in so much information,” he said. “Part of it is to further me as an actor, but another part of it is learning how to communicate information to my students. A lot of the things I do I have the mindset of is this going to make me a better director, or what can I take from this experience back to Grandville to teach to them. With Amanda in the director’s seat, she uses many of the same skills and techniques she does with her students. The last summer show, “Into the Woods,” that the Fischers will be involved in for the season opens Sept. 14, after the start of the Grandville academic year.